If you like David Bowie, The Strokes and Sparks, Franz Ferdinand might be for you. 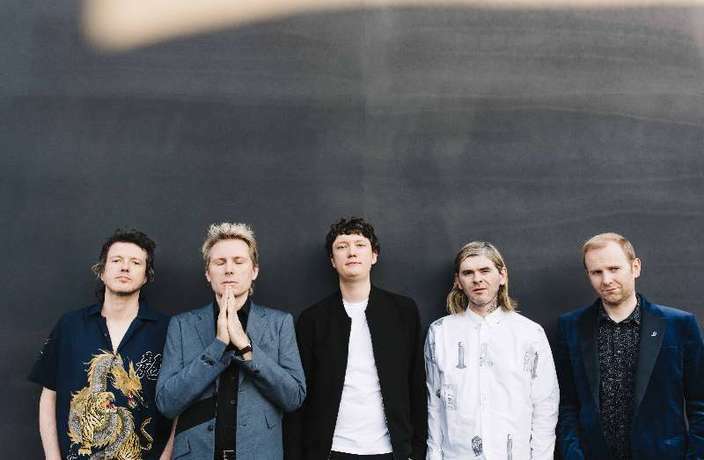 Fourteen years after their iconic self-titled debut album dropped, bringing with it generation-defining tracks like ‘Take Me Out’ and ‘Dark of the Matinee,’ and Franz Ferdinand continue to reinvent themselves. Their fifth studio album, Always Ascending, sees the band step farther away from their typical guitar-driven sound, summoning instead a haze of synthesizers a la fellow British Islanders, New Order. It does indeed feel like bold new territory for the Scotsmen. They haved pushed the boat out much more so than on their last record Right Thoughts, Right Words, Right Action by playing with song structures, synthesizers as well as some fantastic vocal experimentation by Alex Kapranos. With the band’s Guangzhou and Shenzhen venues now announced, and with tickets for those gigs now on sale, we spoke with bassist Bob Hardy about the band’s upcoming tour of China and their continuously changing style of music. We had a listen to the new album and off the top of our heads we felt like we heard a few nods to New Order, David Bowie, Todd Terje. Any validity to that? We like all those guys. Huge New Order fan, huge David Bowie fan and we actually worked with Todd Terje on our last album. That's the sort of music that we are into, like, the dancier end of guitar music. We always saw ourselves as a guitar band that played live dance music using dance arrangements and incorporating them into the live show. You’ve been said to be more of a post-punk band, but even on your earlier albums, there is a lot of focus on the rhythm and making sure that people are getting up and dancing around to the music. What do you think of those kinds of labels? Post-punk was never something that we ever considered ourselves or were even actually listening to at the time that we first came out. When we first appeared people were comparing us to Gang of Four, but we never really listened to Gang of Four, I see New Order as a bigger touchstone for me personally, I mean, Peter Hook and his bass parts are very important for me. Can you talk about how your music has changed as the band has gotten older and your tastes have shifted through the years? The direction that our band has gone has been informed a lot by touring. You record an album and then you release it and then you tour it for 18 months. That tends to inform our decisions when it comes to making new music. We have always borrowed from dance music. This time around though, we sat down to think about what we wanted the record to be like. We decided we wanted to be much more of a dance band and push that idea as far out as possible. How was it incorporating the two new guys (keyboardist Julian Corrie and guitarist Dino Bardot) into the band? We've never had to do it before, but this time around it was very easy. Julian was recommended to us by a mutual friend and the first time he came down to the studio we played him what we were working on. It all felt very natural and easy; very, very quickly it was normal. Then Dino who plays guitar joined after we recorded the album, for the live section. We've known him for nearly 20 years and he has been in the Glasgow music scene for a long time, so immediately it was comfortable. We were lucky. What kind of set can we expect from you guys when you get here? Maybe our own show that we play (in Shanghai) will be more focused on the new record, when it comes to the festivals we try to make the show as hit-heavy as we can, because there will be people in the crowd who aren’t necessarily fans of the band, or maybe aren’t there to see us exclusively. We will still play new songs, but we are more likely to do a mixture of the old and the new together. We'll see what happens on the day. Shanghai: Thu Dec 6, 9pm; RMB320-450. Modern Sky Lab. Guangzhou (Strawberry Music Festival 2018): Sat Dec 8, 8.20pm; RMB220-520. Chimelong Paradise Amusement Park. Tickets. Shenzhen (Strawberry Music Festival 2018): Sun Dec 9, 8.30pm; RMB220-520. Shenzhen Bay Sports Center. Tickets. With the success in recent years of Rap of China on iQiyi, electronic music certainly seems to be the next logical step.